ObanAir Fair played host this weekend to Miss Pick Up, a vintage Catalina flying boat, as well as a fair few more modest flying machines from around the country. Oban airport serves the Western Isles of Scotland with regular commercial flights and charters. It is also a recreational hub with active flying and gliding clubs and regular visitors on cross country excursions; often including military aircraft from all three services. 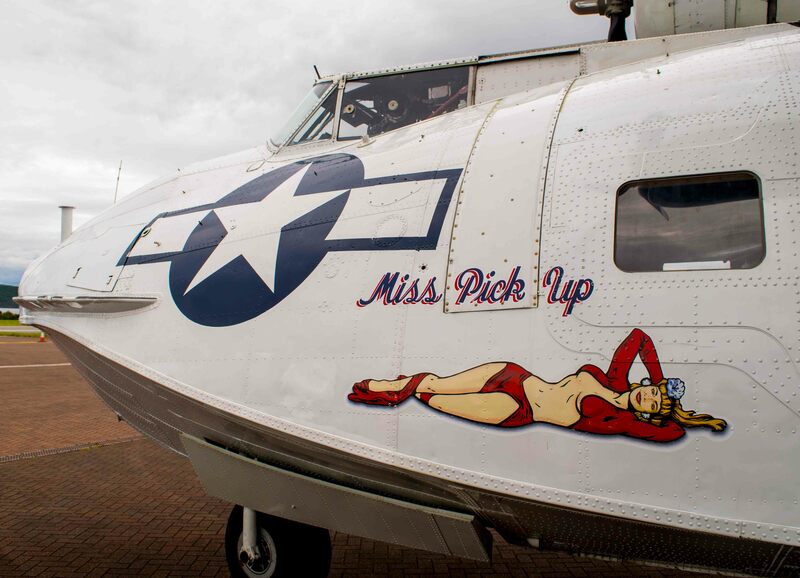 Miss Pick Up is lovingly cared for by a private group of owners based at Duxford Aerodrome, one of the sites of the Imperial War Museum. The name is a reference to her wartime role of air-sea -rescue, not the moral characteristics of the owners. Flying to the aid of stranded pilots or mariners who found themselves having to swim for it after their day did not go to plan, her capacity to land on water, retrieve the survivor and have them back home the same day, not only saved lives but strengthened our defences. How welcome a sight must she have been for those in such a desperate situation? The owners regularly take her on trips throughout the UK and Europe supporting events and airshows while earning a coin or two to keep her flying. I look forward to seeing her strutting her stuff at Ayr beach next weekend. 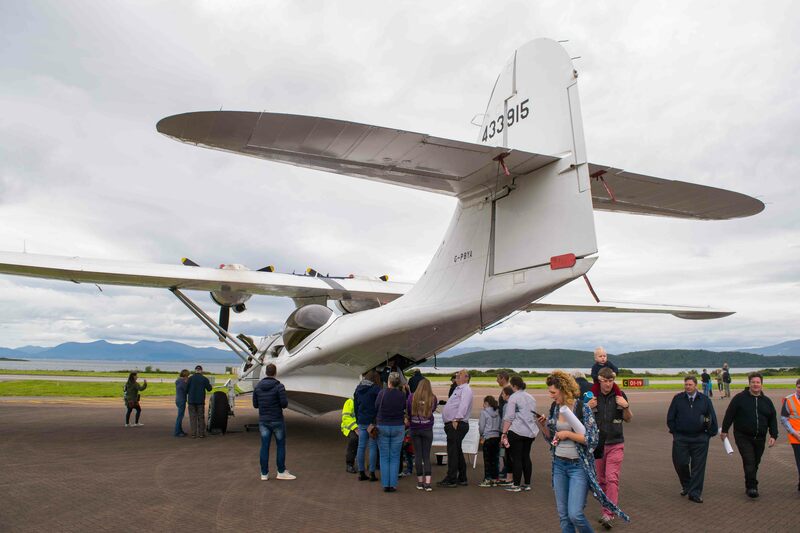 Oban Air Fair was a hit for families. The air fair is an annual event which proved very popular through a broad spectrum of visitors from toddlers to grandparents. Flying in Scotland is not just for the crusty old curmudgeons with deep pockets and opinions, far from it, the average age there was kept low with a steady stream of fascinated kids. The airport fire service had a really popular stall knocking targets over with fire hoses, there was a decent queue of adults wrangling kids so that they could have a go. The classic car club attracted a wide selection of machinery too, from a Model T Ford onwards through the decades. This is now a classic combination, wings and wheels, I'm sure there is a significant overlap of interest among the participants. There is no getting away from it though cars are more practical and easier to keep dry than aircraft. It may well surprise many people just how affordable aircraft can be, not actually that far away from car costs in many cases. Border Air Services offer pleasure flights from Oban, the deal for the Air Fair was £30 per person. Oban is well placed for sightseeing and cross country trips. getting through the mountains can be tricky if the cloud base is below the tops. There is a real danger it can close in around you in the glens, careful planning and good judgement are required on marginal days. Then again you can stick to the coast and get there with less pressure. It is actually quite rare to get so close to the aircraft, let alone get inside for a chat with the crew! The local Air Cadets were assisting with marshalling and directions, one of the many perks of membership. I hope that the Air Fair continues to grow at Oban, I will certainly do what I can to support this and other events around the country. See you there. From Oban Air Fair back to our HOME page.